After a wild pitch Gabriel Noriega tagged out. 5 seconds later Chris Taylor scores after a wild throw by Lookouts pitcher Steve Smith. 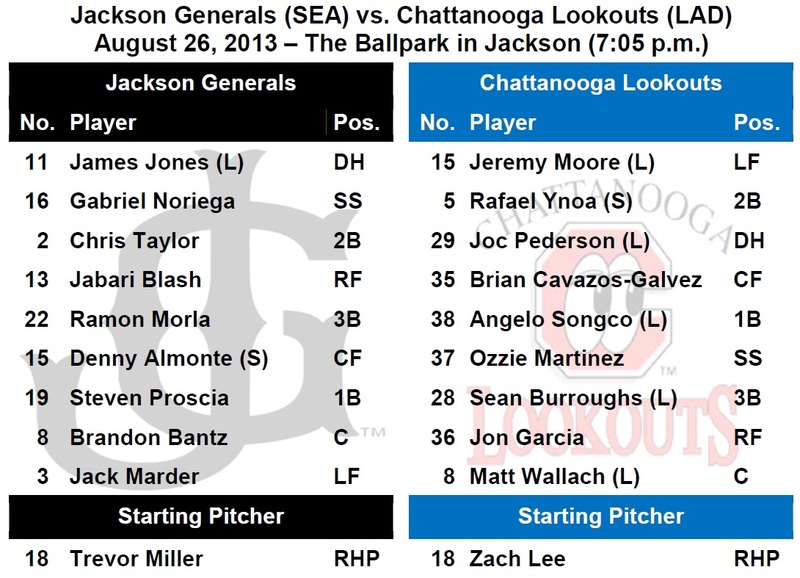 TODAY’S GAME: the Generals continue their final homestand of the season tonight with game #4 of a 5-game series with the Chattanooga Lookouts (1-2)…this season Jackson is 9-9 against the Lookouts and 3-5 at The Ballpark in Jackson…the Generals elimination number is 1 with 7 games remaining in the 2013 season…Jackson will wrap up the season with a 5-game series at Huntsville starting on Thursday. 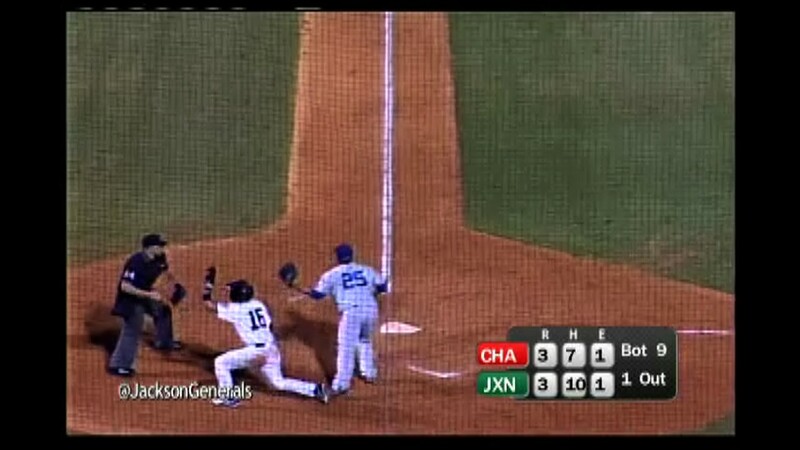 GENERALS RECAP: After one of the craziest finishes to a baseball game you will see, Jackson (29-33) notched a 4-3 victory over the Chattanooga Lookouts (23-39) and ended its 7-game losing streak. The game ended in the bottom of the ninth on a throwing error by Lookouts pitcher Steve Smith that scored Chris Taylor after Gabriel Noreiga was called out trying to score on a wild pitch by Smith. 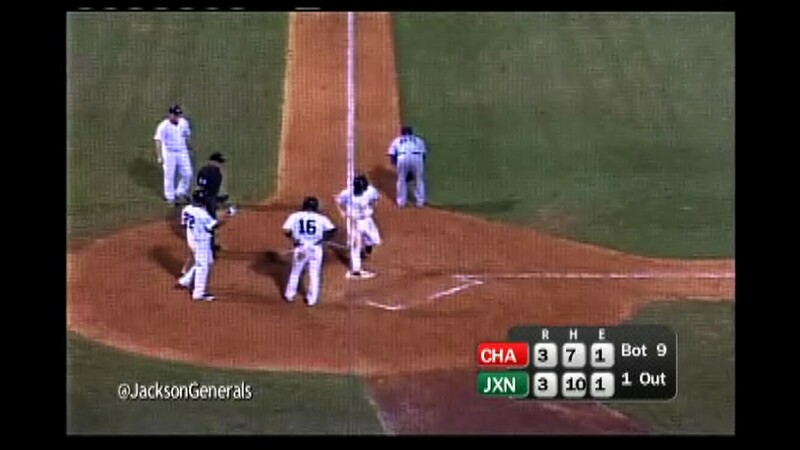 The Generals had a runner on base in every inning except one and though they struggled to bring in runs the home time team grabbed the victory in walk-off fashion. They out-hit the Lookouts for the third straight night, 10-7. NEWS & NOTES: 46 of 128 games have been 1-run games (19-27) which is the T-1st in the Southern League…65 of 128 games have been decided by 2-or-fewer runs (24-40) and 17 have been extra-inning games (5-12)…In games decided by 3+ runs the Generals are 32-27. • BLASH NAMED SL HITTER OF THE WEEK: The Southern League announced Monday that Jabari Blash has been named the Southern League’s Hitter of the Week for August 19-25. During the week Blash batted .500 (12×24) with 2 2B, 2 HR, 6 RBIs, 4 R and 14 BB in 9 games. Blash also posted a .692 on-base percentage. Blash joins Brad Miller, Julio Morban and Ji-Man Choi as winners of the award this season. He has hit safely in each of his last 8 games, batting .417 (10×24) with 4 runs scored, 2 doubles, 1 home run, 6 RBI and 13 walks. • TAYLOR’S HOT AUGUST CONTINUES: INF Chris Taylor is batting .356 (36×101) with 18 runs scored, 4 doubles, 1 triple, 7 RBI, 12 walks and 9 stolen bases in 26 games in August. • THE RELIEVING MA-SCHEEN: RH Stephen Kohlscheen has allowed only 3 earned runs over his last 28.0 innings (0.96 ERA). During this 14-game stretch (since June 26), he is 5-0 while lowering his season ERA from 3.60 to 2.43. • WE GOTCHA!! Jackson catchers lead the SL catching 52.0% of base stealers (65 CS, 125 Att). The next closest is Pensacola which is throwing out 34.8% of base stealers.